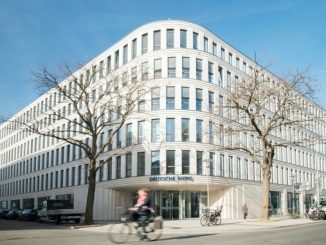 Münchener Hypothekenbank eG (MünchenerHyp) on 8 September unveiled plans for the first ESG covered bond. In this special sponsored feature, those involved in the project consider an ESG Pfandbrief against the backdrop of sustainable investment and explore how it might fit into wider SRI developments in the bond markets. Sponsored by MünchenerHyp, this special report originally appeared in The Covered Bond Report magazine. Download a pdf of this special report here. 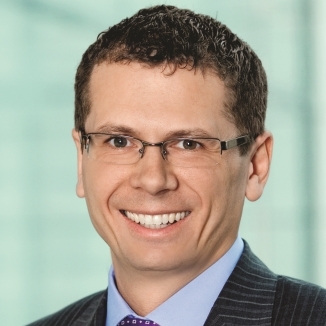 Neil Day, The Covered Bond Report: Why is MünchenerHyp launching an ESG covered bond? Patrick Wellas, MünchenerHyp: First of all, MünchenerHyp has been developing its sustainability continuously over recent years because of the social, ecological and economic needs of our modern world. Furthermore, MünchenerHyp, as a traditional Bavarian mortgage lender in the legal form of a cooperative, sees it as its duty to finance a sustainable and ethical residential loan portfolio that contributes to public welfare. Finally, MünchenerHyp has recognised the need for sustainable bonds resulting from investor demand for ESG investments, which has grown in the last few years. Vincent Hoarau, Crédit Agricole CIB: On the one side, we have a strongly committed issuer, MünchenerHyp, that is already active and dynamic in respect of corporate social responsibility and active in financing social housing in Germany. On the other side, we have seen in Europe a growing base of investors willing to recreate a link between their assets under management and “real world” projects — these investors are sometimes called socially responsible or ESG investors. Indeed, there is at times a disconnect between the bond market — where social and environmental questions are barely mentioned by market practitioners — and the actual function of this bond market, which is precisely to finance real assets. This is why ESG Bonds, and particularly Green Bonds, are supported by a growing base of institutional investors. Day, The CBR: What evidence is there that there is demand for such a product? Kristina Rüter, oekom research: Sustainable investment opportunities have become increasingly sought-after in recent years. All Green Bond issues in the last two years have been well oversubscribed. Pfandbriefe represent particularly low risk investments and as such the ESG Pfandbrief will unquestionably appeal to a broad range of responsible and risk-sensitive investors. However, criticism of green or sustainable bond issues has also been emerging. Stakeholders and investors are increasingly asking for more transparency and the independent review of sustainability criteria, projects and processes to ensure the integrity and the added social and/or environmental value of such investment products. oekom research serves a large number of institutional investors and asset managers who invest in bonds issued by listed and non-listed borrowers — corporates, development banks, supranationals and registered cooperative societies — based on oekom research’s corporate ESG rating. Thus, oekom research’s second party opinion will provide a threefold quality assurance to investors, combining the extra-financial rating of Münchener Hypothekenbank eG as an issuer with the verification of the quality of the criteria framework for the ESG Pfandbrief as well as the compliance of refinanced debt with these sustainability criteria. 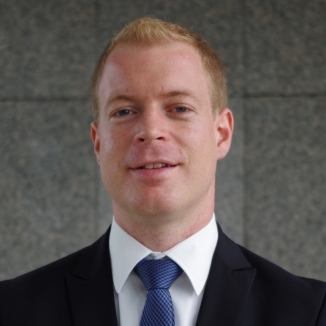 Patrick Steeg, LBBW: The market for SRI (socially responsible investment) bonds is developing rapidly, in line with investors’ willingness to increasingly engage in environmental and social topics. In 2014, worldwide issuance of green bonds is on track to nearly quadruple compared with last year, i.e. to reach Eu30bn equivalent. Development banks and supranationals have a leading position in this, but there is also an increasing market share of corporates. Triple-A issuers make up for more than half of the volume. As the institutional investors who dominate this market are seeking to invest in SRI bonds with a very low risk profile, it makes perfect sense to complement the asset class with triple-A covered bonds that also address that need for extra safety. There are many investors who do need bonds with strictly ring-fenced SRI underlyings and their number keeps growing. To give an example, at LBBW we also work with many smaller institutional clients with a church background who are developing and implementing respective investment criteria. Rafael Scholz, MünchenerHyp: The driving force for issuing a product like this was MünchenerHyp’s own sustainability strategy. In light of that, creating such a product was a logical next step. Another important part of this issue is our role as a pioneer — the forthcoming issue is the first sustainable covered bond globally. Overall, we are looking forward to introducing a new sustainable market for covered bonds. Tim Weber, WGZ Bank: Firstly, we perceive more and more demand for sustainable investment products. There are already some investors who have to hold specific parts of their assets in certified green or sustainable assets. Depending on the varied existing definitions for sustainability, there are different statistics for the market volume of sustainable products, but what you find in all these statistics is a sharp growth of the market volume for sustainable products in the last few years. From our point of view, this underlines the rising importance of sustainability in an investment process. Hoarau, CACIB: When CACIB executed KfW’s inaugural Green Bond transaction, a five year euro-denominated issue, the quality and level of granularity of the order book demonstrated that the sustainability features of the bond attracted new investors who factor such parameters into their investment decisions — to a certain extent, we can even say that they drove the process. The same phenomenon was observed when we built books for EDF, GDF and Unibail SRI corporate bonds in January of this year. Elsewhere, when you look at the demand/supply/redemption dynamic in the German Pfandbrief market, there are other factors that lead one to the same conclusions. Gross benchmark Pfandbrief supply will remain stable at around Eu15bn over the next three years. On the other hand, redemption amounts in benchmark format are around Eu25bn for full-year 2014, 2015 and 2016 — without taking into account redemptions of Pfandbriefe issued in private placement format. This negative net issuance is leading to a mismatch between supply and demand — with the latter growing significantly due to LCR (Liquidity Coverage Ratio) constraints. That said, classical Pfandbrief investors will naturally buy into an ESG covered bond issued by MünchenerHyp, while classical socially responsible investors should look into it for diversification purposes. Day, The CBR: What assets in the cover pool qualify as ESG-eligible? Wellas, MünchenerHyp: The assets backing the ESG Pfandbrief qualify thanks to a combination of the properties’ characteristics and the philosophy of the cooperative company. As hard facts, we analysed, for example, the equity ratios, fluctuation rates, vacancy rates, comparable rents per square meter, and modernisation costs per square meter of the cooperatives versus the biggest German exchange-listed real-estate companies and the market in general. The outcome was very informative and sustainable. As soft factors, we analysed the companies’ charters, for instance in relation to the life-long right of residence, the democratic participation of the tenant, and a sustainable corporate philosophy. Day, The CBR: Why is the volume of the ESG-Bond so low relative to the Hypothekenpfandbrief cover? Scholz, MünchenerHyp: At the beginning of this new project, with the associated uncertainty, we want to manage a smaller volume that is easier for us to control. Meanwhile, we can very quickly identify cooperative housing companies as a sustainable long term investment — because of their corporate philosophy, their legal form, and the data that we have on them and have analysed — and cooperative housing companies constitute only a small part of the actual cover pool of MünchenerHyp. If a market for ESG covered bonds becomes more established in the future, then we will reinforce this segment, too. Day, The CBR: How will you manage these on an ongoing basis? Are the proceeds of the issue only used for further sustainable loans? Scholz, MünchenerHyp: Separation of the proceeds of the refinancing is not possible. However, MünchenerHyp plans a yearly lending volume of between Eu50m and Eu100m of new loans to housing cooperatives. In general, around 80% of the refinanced funds are used for private housing in Germany, where a significant proportion could fulfil the characteristics of a sustainable investment. Day, The CBR: Is this monitored and disclosed? How is this achieved if the cover related to the ESG-Bond is mixed in with the rest of the cover pool? Rüter, oekom research: In our opinion at oekom research, it is important that the proceeds can be traced to the types of loans identified through the ESG criteria framework. This has been verified by oekom research for the first issue. 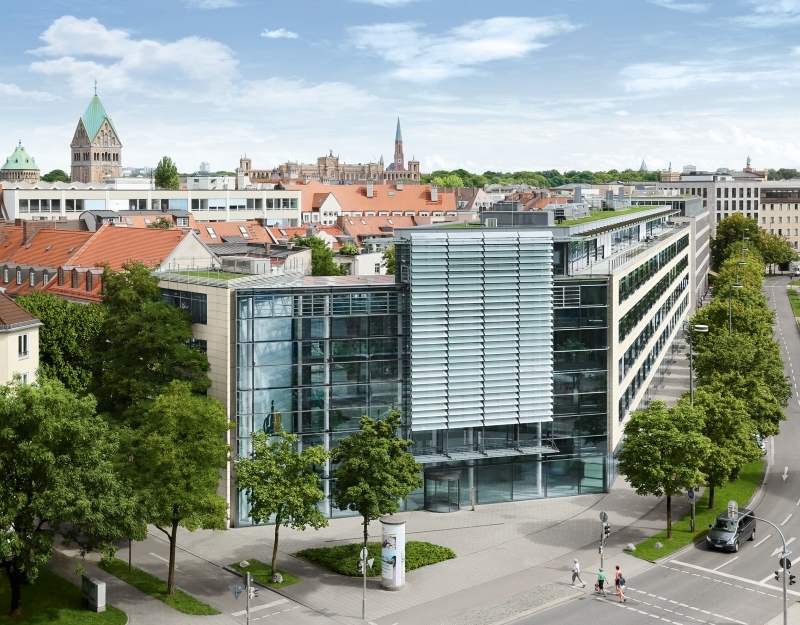 In addition, MünchenerHyp guarantees that the same framework will be applied to further sustainability loans to housing cooperatives in the same manner as this first issue within the five year term of this first ESG Pfandbrief. We would recommend regularly measuring and reporting performance against the sustainability criteria by using the quantitative indicators of the framework. Scholz, MünchenerHyp: Investors will be provided with a quarterly report on our website about the ESG Pfandbrief and specifically the loan portfolio. Disclosure is oriented towards the strong requirements set out in the German Pfandbrief Act. Day, The CBR: What were the key challenges in assigning a sustainability rating to an ESG covered bond? How does it compare with assigning a rating to an issuer? Rüter, oekom research: One challenge is that in the case of a Pfandbrief refinancing of already-granted loans takes place. Therefore the defined ESG criteria do not serve as selection criteria for financing for the first issue, but as ex-post monitoring criteria for the sustainability performance and social/environmental added value created by already-financed objects. 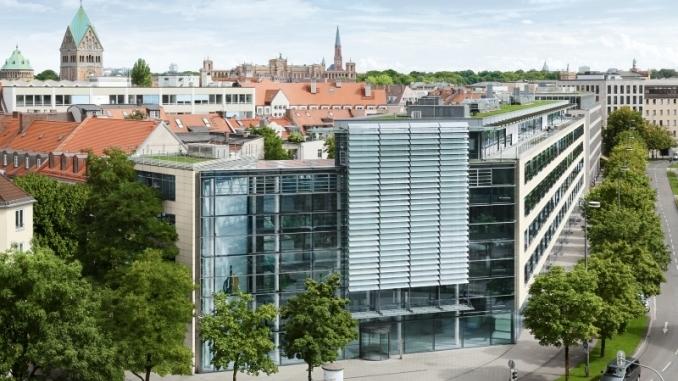 As MünchenerHyp will apply the ESG criteria of this first Pfandbrief issue to further financing of housing cooperatives, the assessment of future ESG Pfandbrief issues under the same framework will be more straightforward. Another challenge lies in the double perspective of ESG verification of both the issuer and the bond itself. It is important for us to balance the ESG performance of the issuer with the quality of the ESG framework of the bond and its adoption in concrete projects and loans. In the case of this ESG Pfandbrief, both the issuer and the bond were positively assessed by oekom research, with the issuer holding the “Prime” status and a robust sustainability criteria framework for the ESG Pfandbrief. Wellas, MünchenerHyp: Oekom research has a sophisticated idea of what sustainable financing must look like and which criteria must be fulfilled in order to designate a bond as an ESG bond. In our case, with an ESG Pfandbrief focusing on financing housing cooperatives, we had to show that social, economic and ecological standards are all met. Oekom therefore looks carefully at qualitative and quantitative data in order to form its view. In contrast, the sustainability rating of a company does not refer to a specific bond issue, but applies to the company’s overall sustainability performance, comprising all the processes within the value-added chain. This includes ESG aspects that refer to corporate governance, sustainability management, environmental management, products and services, as well as the company’s efforts for its staff and for society. However, because the overall rating is also a relevant criterion for the assessment of the ESG Pfandbrief issue, and since the ESG Pfandbrief in turn contributes to the entire sustainability management of the company, the two go hand in hand. Day, The CBR: How is the rating of the ESG covered bond to be understood? Where does it fit in your ratings universe? Rüter, oekom research: oekom’s Second Party Opinion is a qualitative review of the ESG quality of the bond issuance — supported by quantitative evidence — which gives the investor a quality indication of this issue. Our message is that this ESG Pfandbrief is investable in a responsible investment strategy because, firstly, the issuer has a positive ESG performance, secondly, there is a robust ESG framework defining project categories with added sustainability value, which, thirdly, is measured and confirmed with the help of quantitative indicators applied to the financed objects and projects. Our rating universe covers the most important equity and/or bond issuing entities worldwide. Our ESG Corporate Rating of MünchenerHyp is one part of our overall ESG covered bond review. Day, The CBR: Does your ESG covered bond diverge at all from a traditional Pfandbriefe? Scholz, MünchenerHyp: First of all, the Pfandbrief is per se a sustainable financial tool. Since the inception of the Pfandbrief, no German institution that has issued covered bonds has gone bankrupt. A priori, the Pfandbrief already has strict criteria that are derived from the Pfandbrief Act. The ESG-Pfandbrief combines the strict criteria of a typical Pfandbrief and extends these through the addition of the sustainability criteria that were defined by MünchenerHyp and oekom research. Weber, WGZ: On the one hand, the ESG covered bond of MünchenerHyp offers the advantages of traditional German covered bonds that — given its characteristics and historical performance — is one of the investment products with the lowest risk profile in the whole market. Furthermore, the cover pool of the MünchenerHyp bond contains loans for sustainable projects, so the circle of potential investors should be even greater than that for bonds that solely fulfil the features of traditional covered bonds. Therefore the demand for the new bond should be somewhat higher than for traditional German covered bonds, which gives room for either a tighter initial spread versus traditional German covered bonds or a better spread performance in the secondary market. 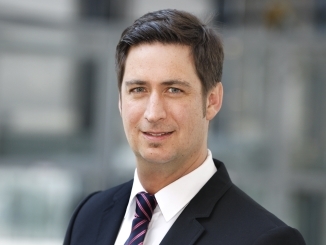 Steeg, LBBW: An ESG covered bond offers to socially responsible investors all the quality ingredients of a traditional Hypothekenpfandbrief, like double recourse, segregated cover pool, governance by the German Pfandbriefgesetz (Pfandbrief Act) and a maximum LTV of 60%. 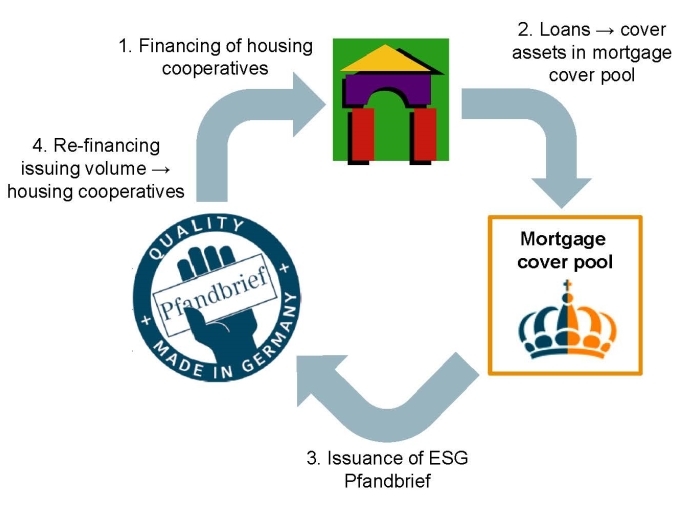 Furthermore, the proceeds of an ESG Pfandbrief are solely invested in German housing cooperatives that are ring-fenced within the overall mortgage cover pool. It is therefore the same bulletproof investment as a traditional Pfandbrief, which additionally supports the development of the market for socially responsible investments. 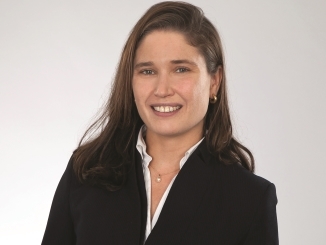 Hoarau, CACIB: This is a premiere and prestigious offering with specific features meeting ESG investors’ requirements. So, per se, there is a scarcity element surrounding the offering. Meanwhile, at a time of growing environmental awareness, governmental pressures will intensify and over time the socially responsible investor base will continue to grow. And in that respect, external pressures and international initiatives like the PRI (Principles for Responsible Investment) are very supportive factors. So we expect a stronger performance in the secondary market, with regular buying flows from specific ESG investors newly entering into the sustainable investment world. Additionally, central banks from the Eurosystem will look at it in the secondary market when CBPP3 starts. Day, The CBR: How might an ESG covered bond trade relative to the rest of the covered bond asset class? 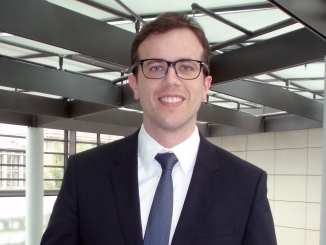 Hoarau, CACIB: In primary, I don’t see any major reason why the inaugural transaction should price significantly tighter than a classical Pfandbrief. In the end, bookbuilding is driven by the historical investor base while the issuer does not have any strong argument to force them to accept a lower re-offer spread. Indeed, the probability of default does not change because you add the ESG technology or some ESG features. Nevertheless, as outlined before, I strongly believe that an ESG offering will outperform the rest of the market in the secondary over time — because you bring in new investors, which is the key element in the process. 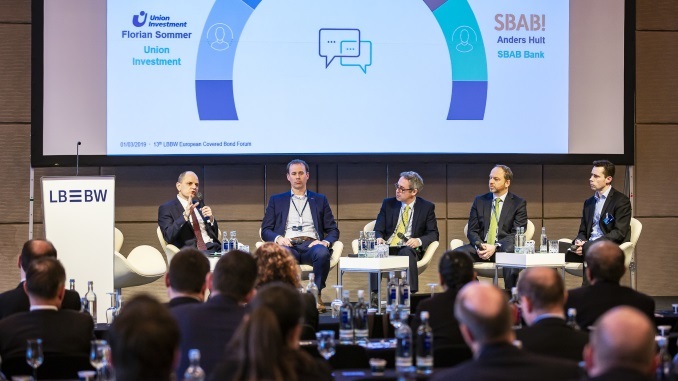 Steeg, LBBW: In theory, there are more potential investors, as the traditional investor base is expanded by investors with SRI awareness. This means potentially more demand and hence room for tighter spreads. On the other hand, there is evidence from issues of triple-A borrowers such as KfW and EIB that SRI issues basically trade in line with standard bonds of the respective borrower. After all, even SRI investors are on a larger scale unlikely to ignore economic principles and should demand a return that reflects the risk of an investment. However, on a case by case basis, supply and demand dynamics, the liquidity of a bond and other terms like deal size, maturity or coupon could have an impact on relative pricing compared with the borrower’s outstanding curve. The main benefit of issuing an ESG covered bond is expected to be investor diversification, thus supporting the funding policy of an issuer as a whole. Weber, WGZ: The initial spread will depend on how many investors with demand for sustainable investment products can be attracted in addition to the existing investor base. If there is a significant number of additional investors, the initial spread will be even tighter than for existing MünchenerHyp covered bonds. An additional investor base could also help the bond outperform existing MünchenerHyp covered bonds in the secondary market. Day, The CBR: Where will a sustainable covered bond fit in the context of other bond issues with various green or SRI monikers? 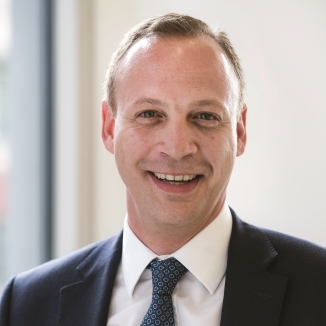 Steeg, LBBW: As with existing SRI formats, the sustainable covered bond will address investors with a particularly demanding investment process. The need of these investors to account for sustainability does not, of course, mean that they are willing to compromise on the quality of the credit. It just adds another dimension to what we believe is generally a top quality product. MünchenerHyp’s ESG Pfandbrief is, therefore, the logical evolution of increased SRI and green bond issuance in the SSA space. Some utilities have also adopted SRI principles, but let’s put those to one side for a moment. What is important to realise is the need to take sustainability seriously. It ought not be a simple marketing gag, but requires significant effort by the issuer to establish a successful format. In return, it enables an issuer like MünchenerHyp to establish sustainability right through from asset origination to its funding policy, and hence across its business model. This is a pay-off worth aiming for, and we believe that diluted formats will find it difficult to achieve the necessary recognition in the market. Day, The CBR: Do you expect an ESG covered bond segment to develop? Scholz, MünchenerHyp: We believe that there is growing demand for a new ESG covered bond segment. The development of a new market like this depends on more than just one issuer. Overall we need the investors, banks and issuer to be successful. Weber, WGZ: In our view, there is room for the development of a sustainable covered bond segment. The rising demand from investors for sustainability will force banks and also companies to issue bonds that fulfil this demand. With the first ESG covered bond from MünchenerHyp, we are at a very early stage of this development. How fast a new segment can become established will depend on this debut bond of MünchenerHyp — although it is rather a long term trend than a temporary phenomenon. Hoarau, CACIB: That’s a very good question. It will depend on a lot of crucial parameters such as: the nature and extent of external and governmental pressures forcing further sustainable or responsible investment; the further development and popularity of dedicated sustainable indices; liquidity standards in the secondary market; and the cash situation and shape of overall supply in the credit market, which might or might not force investors to buy into new segments to invest excess liquidity and get credit exposure. Steeg, LBBW: Yes, and we think this is desirable. Traditionally, the covered bond market has been somewhat slower to embrace product innovation, reflecting the notion of stability and high quality standards. Establishing a meaningful ESG covered bond segment might, therefore, take some time and not be open to all issuers. But this has in general not prevented green bonds from making increasing inroads into the market. In times of ongoing spread and yield compression, SSA issuers like the World Bank, EIB and KfW have successfully launched issues in varying formats. Having the Pfandbrief, as a perceived gold standard, adopt the principles of sustainability is an important message to the covered bond market that innovation and top quality are not mutually exclusive. We at LBBW congratulate MünchenerHyp for having been quick to understand the match between sustainability principles with the high transparency standards it stands for. This will allow the issuer to diversify its investor base and reinforce its reputation of actively addressing investor needs. Rüter, oekom research: With the success and tremendous growth of recent green bond issues and the additional qualities of covered bonds and especially Pfandbriefe in mind, it seems unquestionable that a serious ESG bond segment to be reckoned with will emerge and the near future. In our opinion, the quality of the respective ESG frameworks applied in this context and the independent verification of the ESG performance of projects realised in the realm of such products will play a great role in the success and credibility of the individual ESG covered bond issues. We have already been approached by various other interested potential issuers with requests to assist them in the development and verification of such products. Day, The CBR: How important is it for your partners in the launch of an ESG covered bond to be committed to the idea of sustainability? How important are the lead managers during the process of issuance of the ESG-Bond, in terms of the idea of a sustainability bond? Steeg, LBBW: The ESG Pfandbrief will be recognised as a Pfandbrief with all the top quality aspects associated with it. It is, however, not yet an established trademark when it comes to the additional comfort provided on the sustainability front. Launching a debut transaction will require a fair amount of investor education to allow both, issuer and investors to fully capitalise on the benefits of the format and to address the differences versus softer green formats. This is where MünchenerHyp will find it relatively easy to leverage its excellent standing and convey the relevant information to the market. Having lead managers with a broad reach and a clear commitment to sustainability will clearly facilitate the investor communication and make sure the transaction is the start of a sustainable success story. Weber, WGZ: From our point of view, it’s a matter of credibility. If you are really committed to sustainability, you choose partners that take sustainability seriously. This is the only way to convince an ESG investor basis. It makes no sense to clean up your flat leaving a lot of dirt outside the door, because your flat will probably be dirty again before you can say Jack Robinson. Hoarau, CACIB: On the back of a strong commitment from our general management, Crédit Agricole CIB has invested in the ESG bond market since 2009. We have a dedicated team that knows ESG investors inside-out and on a global basis, and all our capital markets teams — origination, syndicate, sales — have had several opportunities to work on concrete Green Bonds. 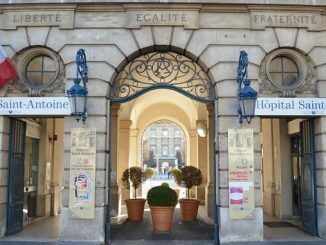 Crédit Agricole CIB is probably the sole global house with such a complete alignment of expertise to execute Green Bonds on a global basis, and for any type of bond. We were, by the way, the sole European bank to co-found and co-draft the Green Bond Principles and we were vote best SRI dealer last year in GlobalCapital. Elsewhere, high quality Pfandbriefe are expensive in spread versus swap terms, but attractive versus the German government curve. While the covered bond market is “bid only”, secondary market levels are squeezed well through the swap curve and therefore they are not the best possible guide for primary pricing. So you also need experienced covered bond partners to properly navigate through those numbers and distribute such a visible and landmark trade well inside mid-swaps. Day, The CBR: Will this new concept help the flow of credit to socially responsible causes? 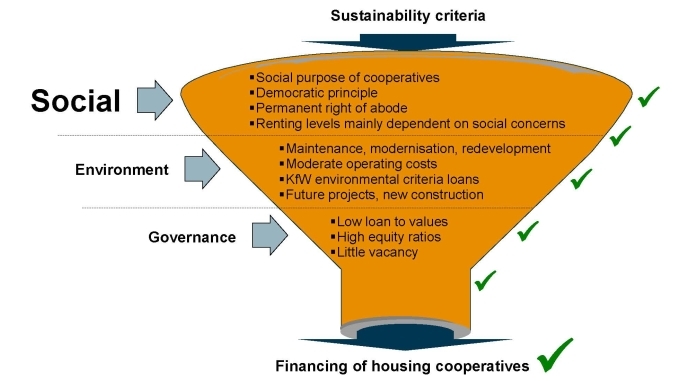 Weber, WGZ: In line with the corporate philosophy of the cooperative sector, the green covered bond will finance cooperative housing companies, whose objects and projects adhere to a set of sustainability criteria. The Second Party Opinion by oekom confirms the positive ESG rating of MünchenerHyp itself, the robust ESG added value framework of the covered bond and a solid measurement based upon quantitative indicators, which are applied to the financed properties. In terms of social responsibility, it is desirable to promote the flow of credit to housing cooperatives, which, for example, advocate renting levels mainly dependent on social concerns, moderate operating costs and low vacancy levels. 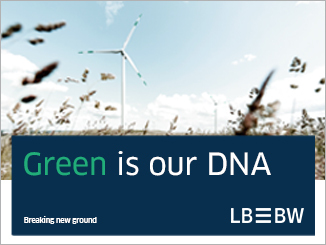 Steeg, LBBW: By establishing a new standard on top of the current wave of primary green bond production out of the SSA sector, we are convinced that this new concept of an ESG Pfandbrief will foster further socially responsible financing activities. This trend will help to develop this market from the current niche status into the broader capital market — provided that institutions align their business origination accordingly. The ring-fencing concept of the MünchenerHyp ESG Pfandbrief guarantees that all proceeds are invested solely in socially responsible housing cooperatives, and that MünchenerHyp will replace maturing loans with new loans in the same asset category. A pioneering MünchenerHyp transaction will certainly trigger followers from the Pfandbrief community and thereby represent the cornerstone of a new market segment that will ultimately lead to an increase in the supply of finance to socially responsible investments. Deutsche Hypo sold a EUR500m green Pfandbrief issue last Monday, its second such benchmark, and officials at the issuer described the deal’s “dynamic” book as being a positive statement of green investor’s trust. 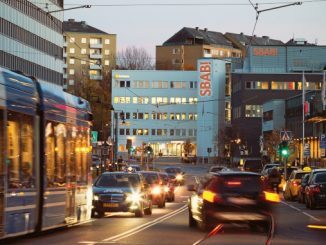 SCBC could launch the first Swedish covered bond backed by residential mortgages for energy efficient properties, after parent SBAB took a pro-active approach to offering clients a new green mortgage and added the product to its use of proceeds.